This is an ideal business startup and you don’t need to be an expert photographer. The equipment enables the user to photograph from any height up to 12 metres. 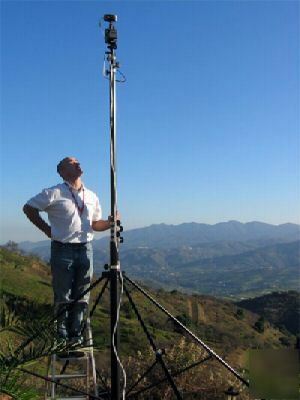 It is a fully portable mast system that can be positioned and assembled within five minutes by one person. The user is able to view live time images direct through the eye of the camera via the laptop below ensuring perfect imaging every time. Because I'm not branching into other things , need room in my garage or need to make way for the baby ! The tripod is permanently connected to the mast and is operable at extreme gradients, not possible with the 12 metre seperate tripod mounted masts ! an aditional advantage is that a simple inexpensive tube can be connected to a vehicle towbar (see picture) for situations where a vehicle can be used. Everything is TESTED prior to dispatch to ensure smooth working operation. I Split my time between Fuengirola ,Costa del Sol, Spain and Worsley ,Greater Manchester. although my successful Low Altitude Aerial Photography work is done in the costa del sol . I provide a dedicated two day airfreight service to the uk or mainland Europe and this is included in the sale. I also research and develop them continuously. but I will sell you a custom built system and happily provide a days training here in the Costa del Sol . All other leads, remote controls, carry cases, covers, spirit level etc. Includes introduction to photoshop, camera techniques , sales and marketing etc. Stock photographic images of properties. I am advertising this system on my website and elsewhere so I reserve the right to withdraw this item from sale at any time.